Service-oriented Manager with 15 year background in Convenience and Retail sectors. Core competencies include excellence in customer service, marketing, merchandising as well as excellent communication and time management skills. Increased store profits by utilizing item by item management, controlling expenses, setting daily weekly and monthly aggressive sales goals. Building excellent customer service team by greeting and assisting customers, and responding to customer inquiries and complaints. Monitor sales activities to ensure that daily weekly and monthly goals are being met by providing customers excellent service and top selling products with high gross profit that are in stock and on display. Assign employees to specific sales duties on regular basis with feedback and follow up. Examine merchandise to ensure that it is correctly priced and displayed using planograms and that it functions as advertised. 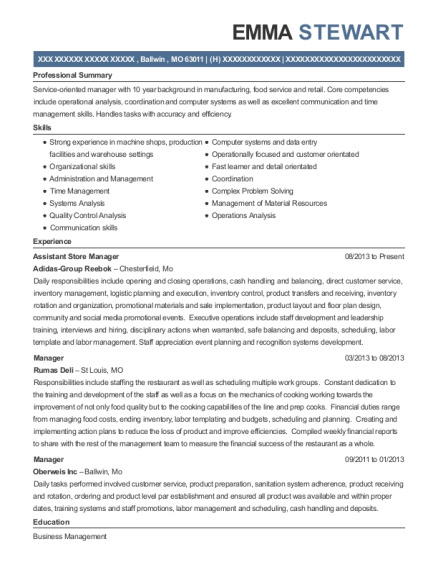 Managed daily store operations including recruiting highly motivated staff and training and coaching them to achieve sale goals, increasing sales by focusing on high gross profit products with focus on fresh food, preparing work schedules and assigning specific duties, setting sales goals and follow up on them. Executing retailer initiative by executing item by item management by focusing on top sellers with high gross profit items and deleting slow sellers using different reports like ABC analysis. Coaching and training staff on proper ordering using F+M-I=O to ensure that top sellers are in stock for our customers 24/7. Increased stores profit by controlling expenses like using payroll by customer count, analyzing write offs to see if we are not writing off too many slow selling fresh food products, controlling high theft products like cigarettes, phone cards, and lottery, and watching video for 15 minutes on daily basis. Making sure store is according the recommended Planogram .Changing layout based on seasonality. Bachelor of Music : Music Jun 1986 Colorado State University Fort Collins, CO Full Scholarship awarded beginning Fall 1982 through 8 semesters. The University of Akron Akron, OH Graduate Teaching Assistant 1986-1988, full stipend. 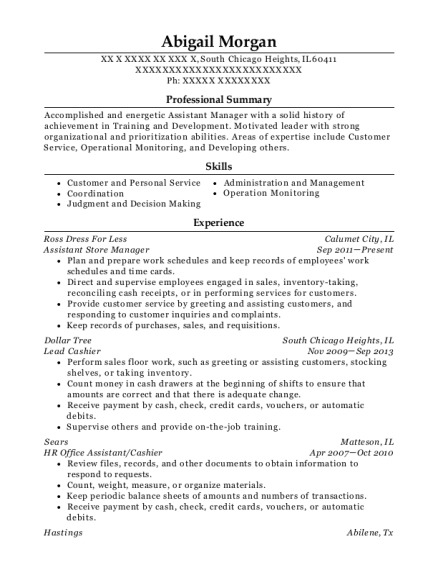 This is a resume for a Assistant Store Manager in Denver, Colorado with experience working for such companies as Tuesday Morning and 7 Eleven Inc. 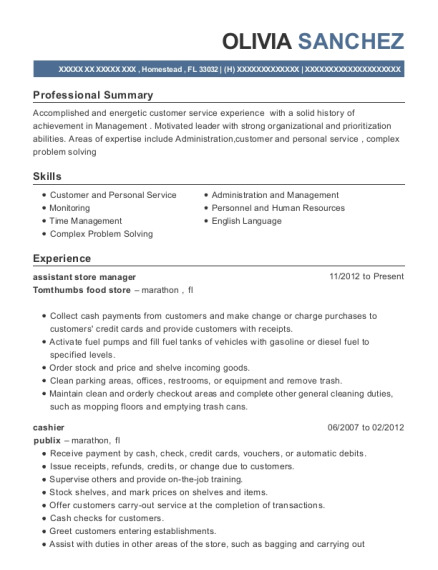 The grade for this resume is 0 and is one of hundreds of Assistant Store Manager resumes available on our site for free. 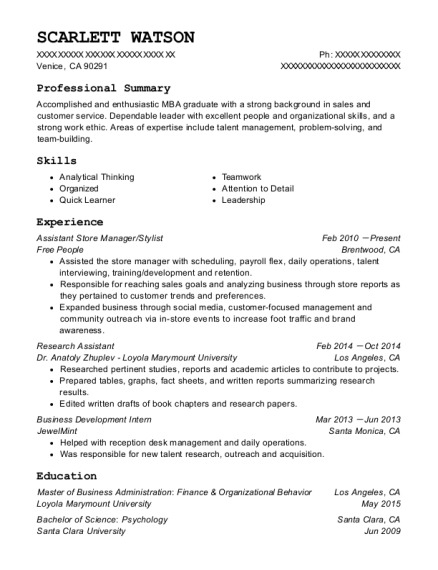 Use these resumes as templates to get help creating the best Assistant Store Manager resume.